Rosa’s is known for Tex-Mex style food but more recently, the Hamilton restaurant has become known for Bermuda-style fish sandwiches. 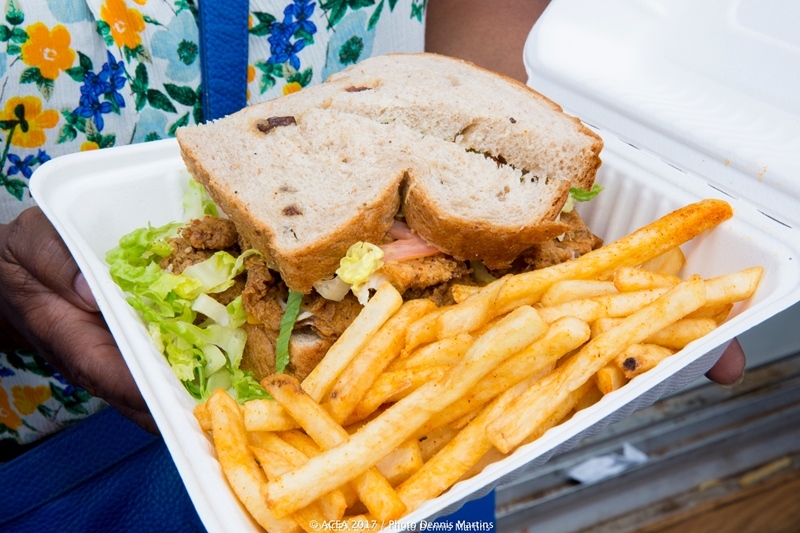 Two years ago, they won Bermuda Tourism Authority’s fish sandwich competition, and Rosa’s is serving up the delicious sandwich in the America’s Cup Village to tourists and locals alike, and it’s proving to be a very popular dish. 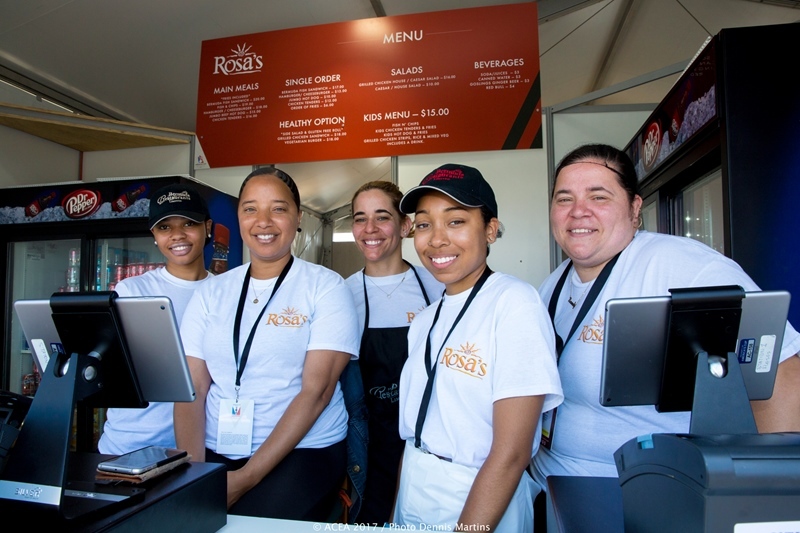 Rosa’s is fully staffed to serve up tasty Bermudian treats within minutes, including chefs quickly frying fish, which has proven to be the most popular item on the menu. Asked about the process to become an official food vendor for the America’s Cup, Ms Durham says the restaurant was excited to be considered. Ms Durham said the most popular items on the menu are of course the fish sandwiches, but also fish and chips and the burgers have been big sellers. She said the kids meals were quite popular as well. “If you want the best food in the America’s Cup Village, we guarantee to give you a great value meal”, she added. Encouraging Bermudians to come up to the America’s Cup Village, Ms Durham said: “What they did to build the America’s Cup Village is amazing. It’s for everybody. There is so much to do and there’s a beautiful kids zone. Rosa’s menu includes hot dogs, chicken sandwiches, salads, veggie burgers, chicken tender, chicken wings and more. There are also gluten free options for those with allergies. These fish sandwiches are amazing!! The only disappointment I had when I took one out of the restaurant was that it didn’t have coleslaw on it as advertised. Otherwise, it was slamming!! How much does the sandwich costs? AC Village has not seen a real fish sandwich. I came to the village had food from Rosas and they always sever food with a smile. Loved their food. The other stalls need to be able to turn over food like them. Love love love their fish and chips. Keep up the good work. Also a young lady name Shayla served us and she is great. Go check out Rosas up the village my now go to place when I go there. Great job Rosa’s Cantina. Three of the girls are sisters and have done a great job at to make Rosa’s a house hold name. Ill check out de village when everything is over, thanks. No loss to us lmfao. U actually think anyone wants u there? Or cares for that matter. U sayin u dont wanna go is like announcing the sky is blue. Lmao. Thank you OJ. For once, thank you. Hats off to Rosas. Not only was their food amazing but they were able to keep their line moving. We did not have to wait long for our food. The young lady that was yaking the orders was so sweet. Service with a smile. The owner was there with her staff smiling along with them. Very friendly.